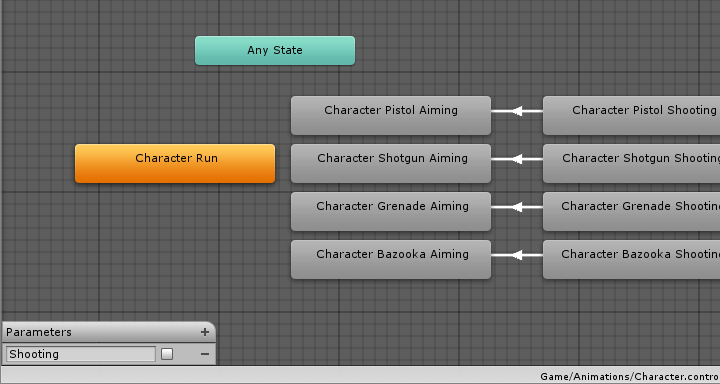 I have a very simple animation parameter in the Animator, a boolean that is "true" when a shooting animation is playing (to stop the game logic from allowing more shooting during a gun recoil animation). I assumed I'd be able to access this in animations, i.e. setting it to true when a shooting animation started, and false when it ended. But I just can't see how to access it in my animations. It's not available under "Add Curve". Am I missing something? I can do this in other ways, but this just seemed like the cleanest. AFAIK, yes, the parameters can only be changed via scripts. To stop the game logic from allowing more shooting, you should NOT be making a parameter here. The Animator doesn't need to know anything about that, it only cares about animation blending and transitions. Make a private boolean variable in the script that actually triggers the shooting and don't trigger the shooting when (e.g. :) _isShooting is set to true. You can use something like a coroutine to make a set delay. Animator parameters exist to enable transitions, that's all they do. How can I make the second soldier to stop walking once he is reaching the console? How to animate material alpha property via script?